A card is drawn at random from a pack of 52 cards. Find the probability that the card drawn is neither a king nor a queen. If the probability of winning a game is 0.3, what is the probability of loosing it? Five cards-ten, jack, queen, king, and an ace of diamonds are shuffled face downwards. One card is picked at random. (i) What is the probability that the card is a queen? Five cards – ten, jack, queen, king, and an ace of diamonds are shuffled face downwards. One card is picked at random. A bag contains 3 red balls and 5 black balls. A ball is drawn at random from the bag. What is the probability that the ball drawn is (i) red? (ii) black? A coin has only two options-head and tail and both are equally likely events i.e. the probability of occurrence of both is same. Hence, a coin is a fair option to decide which team will choose ends in the game. Harpreet tosses two different coins simultaneously (say, one is of Re 1 and other of Rs 2). What is the probability that gets at least one head? (i) Probability of a sure event is ________. (ii) Probability of an impossible event is _______. (iii) The probability of an event (other than sure and impossible event) lies between ______. (iv) Every elementary event associated to a random experiment has _______ probability. (v) Probability of an event A + Probability of an event 'not A' = ___________. (vi) Sum of the probabilities of each outcome in an experiment is ____________. A box contains 100 red cards, 200 yellow cards and 50 blue cards. If a card is drawn at random from the box, then find the probability that it will be (i) a blue card (ii) not a yellow card (iii) neither yellow nor a blue card. A box contains cards numbered 3,5,7,9,…,35,37. A card is drawn at random from the box. Find the probability that the number on the drawn card is a prime number. A group consists of 12 persons, of which 3 are extremely patient, 6 are extremely honest and the rest are extremely kind. A person from the group is selected at random. Assuming that each person is equally likely to be selected, find the probability of selecting a person who is (i) extremely patient (ii) extremely kind or honest. Which of the above would you prefer more? (iii) Not a perfect square number. What is the probability that an ordinary year has 53 Sundays? (viii) that the product of numbers appearing on the top of the dice is less than 9. (ix) that the difference of the numbers appearing on the top of the two dice is 2. (x) that the numbers obtained have a product less than 16. 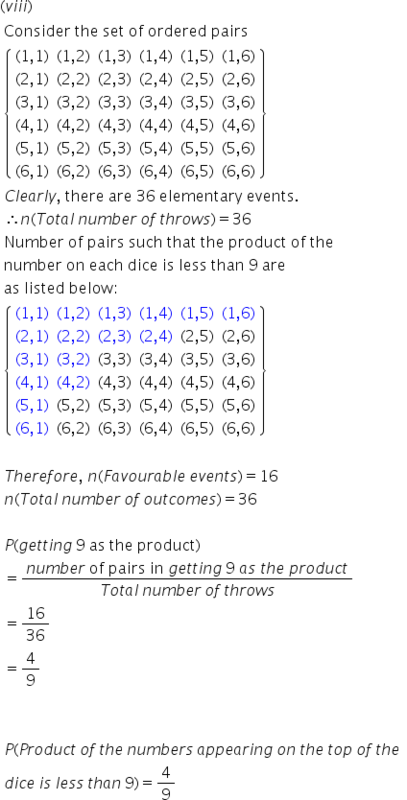 A number is selected at random from first 50 natural numbers. Find the probability that it is a multiple of 3 and 4. (i) 5 will not come up either time. (ii) 5 will come up exactly once. Two customers are visiting a particular shop in the same week (Monday to Saturday). Each is equally likely to visit the shop on any day as on another day. What is the probability that both will visit the shop on (i) the same day? (ii) different days? (iii) consecutive days? Let A be the event ofgetting exactly two heads. Three coins are tossed together. Find the probability of getting :At least one head and one tail. Let A be the event of getting at least one head and one tail. Let A be the event ofgetting no tails. The sum of the two numbers that turn up is 8? Let A be the event that the sum of two numbers which turn up is 8. Of obtaining a total of 6? Let A be the event that the sum of two numbers which turn up is 6. A black die and a white die are thrown at the same time. Write all the possible outcomes. What is the probability that :Of obtaining a total of 10? Let A be the event that the sum of two numbers which turn up is 10. A black die and a white die are thrown at the same time. Write all the possible outcomes. What is the probability that :Of obtaining the same number on both dice? Let A be the event of obtaining the same number on both dice. A black die and a white die are thrown at the same time. Write all the possible outcomes. What is the probability that : Of obtaining a total more than 9? Let A be the event of obtaining a total more than 9. A black die and a white die are thrown at the same time. Write all the possible outcomes. What is the probability that :That the sum of the numbers appearing on the top of the dice is 13? Let A be the event that the sum of the numbers appearing on the top of the dice is 13. The maximum total of the numbers on the dice is 12. A black die and a white die are thrown at the same time. Write all the possible outcomes. What is the probability that :That the sum of the numbers appearing on the top of the dice is less than or equal to 12? Let A be the event that the sum of the numbers appearing on the top of the dice is less than or equal to 12. A black die and a white die are thrown at the same time. Write all the possible outcomes. What is the probability that :That the product of numbers appearing on the top of dice is less than 9. Let A be the event that the product of numbers appearing on the top of the dice is less than 9. A black die and a white die are thrown at the same time. Write all the possible outcomes. What is the probability that :That the difference of the numbers appearing on the top of the two dice is 2. Let A be the event that the difference of the numbers appearing on the top of the two dice is 2. A black die and a white die are thrown at the same time. Write all the possible outcomes. What is the probability that : That the numbers obtained have a product less than 16. Let A be the event that the numbers obtained have a product less than 16. 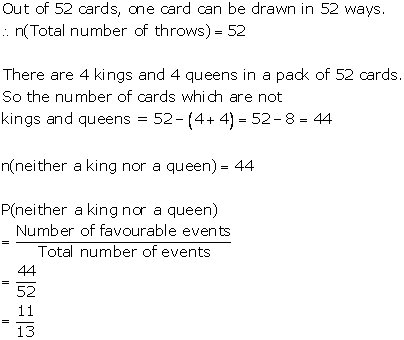 A target shown in Fig. 16.11 consists of three concentric circles of radii 3, 7 and 9 cm respectively. A dart is thrown and lands on the target. What is the probability that the dart will land on the shaded region? Assume first circle to be the circle with the smallest radius, that is 3. 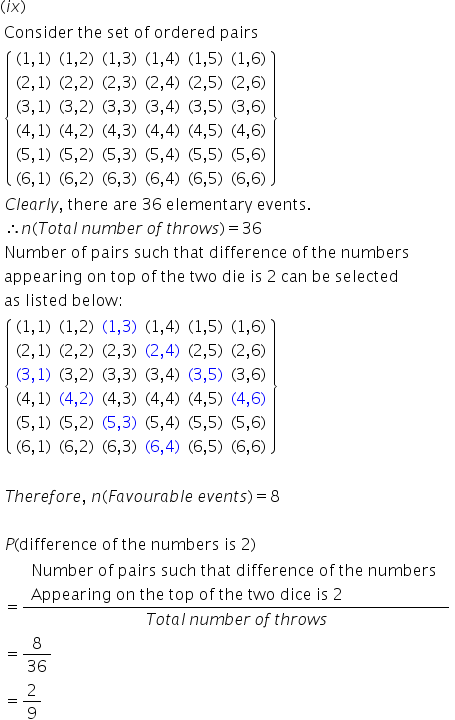 Similarly, second circle to be the circle with radius 7 and third circle to be the circle with radius 9. In Fig. 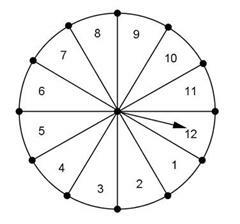 16.12, points A, B, C and D are the centres of four circles that each have a radius of length one unit. 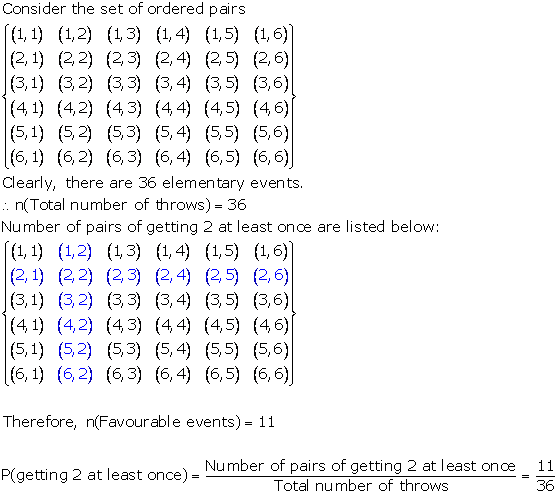 If a point is selected at random from the interior of square ABCD. What is the probability that the point will be chosen from the shaded region? 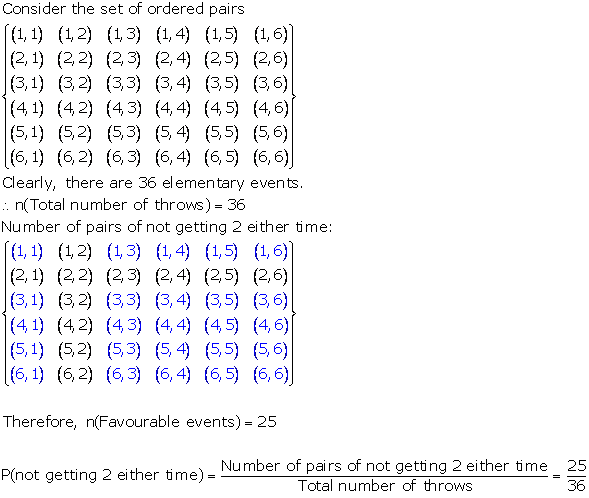 In the fig., JKLM is a square with sides of length 6 units. Points A and B are the mid-points of sides KL and LM respectively. If a point is selected at random from the interior of the square. What is the probability that the point will be chosen from the interior of JAB? In the fig., a square dart board is shown. The length of a side of the larger square is 1.5 times the length of a side of the smaller square. If a dart is thrown and lands on the larger square. 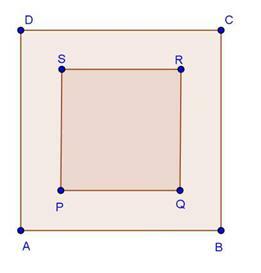 What is the probability that it will land in the interior of the smaller square? 3 coins are tossed simultaneously. Note: The answer does not match the options in the question. 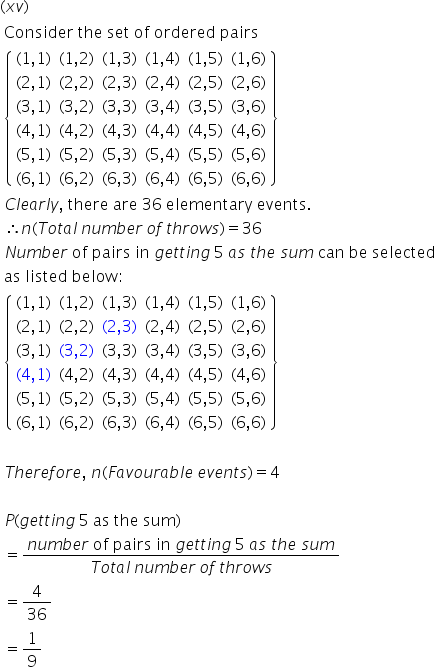 (a), (c), (d) satisfies the (1) but (b) is a negative number. It can't be the probability of an event. Which of the following cannot be the probability of occurrence of an event? Hence (d) is correct option. An event that is certain to occur is called Certain event. Probability of certain event is 1. Ex: If it is Monday, the probability that tomorrow is Tuesday is certain and therefore probability is 1. Events that are not possible are impossible event. Probability of impossible event is 0. Aarushi sold 100 lottery tickets in which 5 tickets carry prizes. If Priya purchased a ticket, what is the probability of Priya winning a prize? 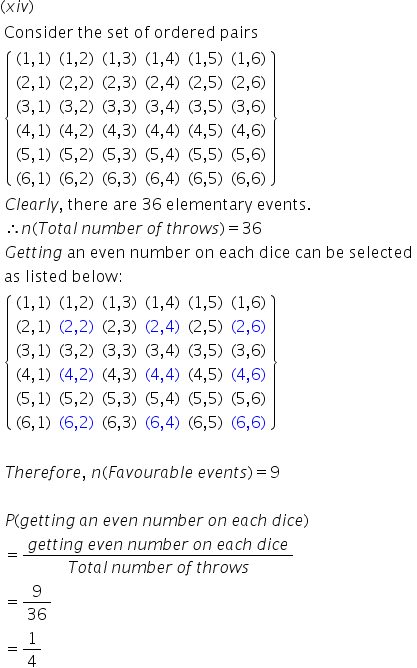 A number is selected from first 50 natural numbers. What is the probability that it is a multiple of 3 or 5 ? There are 365 days in a non-leap year. 52 complete weeks and 1 spare day. so This day can be any out of 7 day of week. Now, year already have 52 Sundays. so for a total of 53 Sundays in a calendar year, this spare day must be a Sunday. We know on throwing a pair of die there are a total of 36 possible outcomes. What is the probability that a non-leap year has 53 Sundays ? So this day can be any out of 7 day of a week. Now, a non-leap year already has 52 Sundays. So for a total of 53 Sundays in a calendar year, this spare day must be a Sunday. What is the probability that a leap year has 52 Mondays?